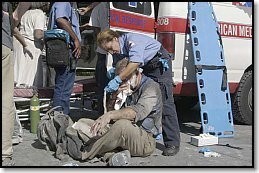 The following narrative was authored by Michael Karch, MD, an orthopedic surgery resident at Georgetown University Hospital who took it upon himself to rush to Ground Zero on September 11, 2001. It was originally emailed to associates and friends and has since been passed around the Internet. There are some excellent insights here for anyone who finds themselves in the middle of any natural or manmade disaster (some of his conclusions are focused on an urban situation such as he experienced, but most are universally applicable). We have formatted this for easier reading. It's Saturday morning and I am sitting down at my computer trying to collect my thoughts after spending 48 hours in a MASH unit at Ground Zero. Tuesday morning in Washington, DC, we went on level 1 Terrorist alert at approx. 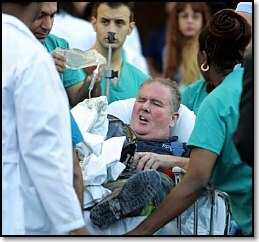 0900 after the Twin Towers were hit. Most of us were shocked and frankly watching the TV not thinking that this would actually happen to us about 40 minutes later. When the news came that the Pentagon was hit we scrambled to set up with expected ER admissions in the hundreds. Only one patient actually came, with severe 3rd degree burns and smelling of jet fuel. Nothing, of course, came afterwards because most of the victims died. Feeling extremely frustrated, I jumped on a train and headed for NYC. I packed a backpack filled with food, water, water filter, stove, headlamps, clothes and medical supplies (dressings, Silvadine, trauma scissors, suture kits, plaster, ace, etc.). No thought was given by me to bring a helmet, gas mask, goggles, rain wear, or multiple socks...all of which I needed in order to work and all of which I eventually obtained but could have used right away. Outside NYC Penn station the air was smoky with ash in the air. I took a cab initially to St. Vincent's Hospital but they said more help was needed at Pier 61 (Chelsea pier) about 20 blocks from Ground Zero. I took a cab there and began working. Chelsea pier at that time was a combined clinic for the walking wounded and morgue. As the clinic was becoming less and less busy by the time I got there and the morgue more and more busy, I was assigned to carrying body bags from a truck and lying them out on the ice (Chelsea pier is a ice skating rink). After about 2 hours of this, word came out that the fire at Ground Zero had been controlled enough so that forward medical personnel could go in. They called for volunteers and I and 2 other physicians (ER and general surgery) went. Actually getting to Ground Zero was no small feat as there is a check point about 10 blocks out where no reporters, civilians, etc. can go past. For future reference please bring ID, medical license, credentials. 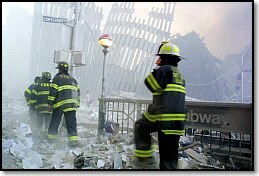 Fortunately I had taken these and I was shuttled up to about 4 blocks from Ground Zero and dropped off as there was no road left. We walked up about 2 more blocks and dropped off gear at a local high school which had been deemed a medical and general supply staging area. And then we left for the front. To get to Ground Zero, one has to walk thru a maze of 6-12 inch ash, paper, twisted iron, mud, junk, rubble....it looked like a tornado had hit the city. Next, you have to walk through a bombed out portion of 2 World Financial Building... it is essentially a pitch black 150-200 meter tunnel with water up to your boot line. This is where the "Atrium" dining area used to be with high vaulted multifaceted glass ceilings and palm trees looking up at the Twin Towers. It was decimated as the steel structure supporting the huge glass windows had caved� in...there was cable, and iron, electrical lines, glass, mud, ash, and running water everywhere. Through this and in the backdrop of smoke one could see the outside front wall of the North Tower which was now only about 5 stories high atop a huge pile of burning rubble and leaning 45 degrees...Hollywood could not have created a scene as bad as this. The tunnel then continued on for another 100 meters or so past underground mall shops and stores with the front windows smashed in on blast impact until one finally reached the outside and Ground Zero itself. Up to this point, my understanding of the event had been limited by what the TV cameras had shown me. I was immediately struck by the immensity of destruction and the fact that it wasn't just the Twin Towers... it was a 2 block radius of decimation. The smell of rotting flesh and ash hit me like a wave.� Cars, busses, a fire truck were smashed, thrown, turned over. There was a body in one of the cars and another flattened on the ground who had apparently jumped. Body bags were being brought in empty and being returned only half filled. This was the most horrific thing I have ever seen. All the buildings still standing around the perimeter were severely damaged and some were leaning and ready to fall into the "pit". 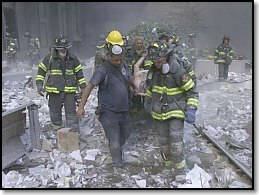 Fireman, the hard-asses of NYC, were dazed, crying...it was an unexplainable sight. The three of us set up a MASH unit at the base of a building in what became known as MASH Unit Ground Zero West. I dumped my backpack supplies and went back thru the "tunnel" to the staging area 2 blocks back to pick up more supplies while the others set up the mini hospital. I ran this shuttle 4 or 5 times with my pack full of dressings, betadine, and saline eye wash which was desperately needed ... each time, I was convinced that the "tunnel" was going to collapse on me ... thank God for speed workouts on the track as my heart was racing about 250 beats per minute. 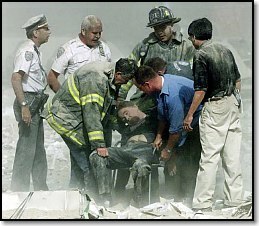 Once Ground Zero West was fully stocked we began treating the fireman...The guys are complete animals and it was like a football game mentality�patch them up and get them back to the pit to work (mostly laceration, eye washes, inhalation, burns, etc.). The firemen began bringing out bodies in bags and placing them down at the edge of the pit which was in front of the MASH unit...the smell became incredibly bad and I soon found myself on a crew carrying these bodies back thru the "tunnel" to the outside perimeter. We piled them in a bread truck to be taken back to the ice rink morgue. Out of the 17 that we carried out, only one was a complete body. In fact one bag was so light that when we picked it up we thought it was empty and cast it aside, only to find out that it had only half of an ankle and foot inside, there was no more. At about 0100 Thursday morning a report came out that there were people with a cell phone trapped below us. The WTC has a 5 story underground mall beneath it. The 3rd, 4th, and 5th floors were crushed but apparently the bottom 2 were intact The crews began digging and trying to find these people. Unfortunately, the crews couldn't get there and the fear is that by now the mall itself has filled with water from the fire hoses. Firemen have a bond that is stronger than brotherhood.� New York firemen live and die by this creed and the New York ironworkers and cops are of the same breed. These men are the American heroes. They truly felt that the only reason that they themselves were alive is because they were late for work that day, or their truck got caught in traffic, or they were on vacation, or it was their day off, etc. So when their shift was over in the "pit" they would not leave, but just stood there at the edge of the pit waiting for their buddies to get pulled out. Time flew by and their "rest" period was over and they had to go back into the pit unrested. These men were starting to get tired, even dazed, and this can be very dangerous around heavy equipment, fire, twisted iron, etc. It was just a matter of time before someone got hurt. My respect for the American fireman, cop, iron worker, medial personnel, red cross, Guardian Angel, volunteer in any form is at an all time high...these are unbelievable people who live in an incredible place and will overcome this. 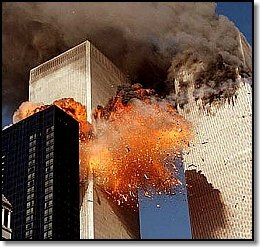 I never had a chance to see the infamous WW-II generation at its peak but I did get to see America at its finest hour on September 11, 12, 13, and 14, 2001. This continued on like this until early afternoon Thursday. The building that I was set up under shifted which caused a mini mass panic and actually resulted in 3 ankle fractures from running. All the small, ad hoc MASH units (Ground Central West, Ground Central East, Church Street, etc.) were ordered to move back thru the "tunnel" and set up a hospital at Stuyvesant High School, the old supply staging area. This hospital was masterminded by a Sloan Kettering ER physician by the name of Rich Hutchinson (?) I can't remember his full last name). By this point we had a staff of about 100 (docs, nurses, techs) with about 100 more Red Cross and Guardian Angels. We had no power nor communication system so we set up a system of runners just like we had created with the forward MASH units a day earlier at Ground Zero. The plan included a triage area up front, a surgical/burn/ortho/laceration area, respiratory, medicine, dermatology (blisters), eye wash/ophthalmology, pharmacy/supply, and psychiatry areas down stairs at ground level with a food, rest, and massage area upstairs. In addition, we kept a temporary MASH unit up and working while we built the hospital. We literally cleared an entire wing of the high school and then set up. Rich deemed team leaders in each of the specialties so that each of the team leaders would set up their subunit and he would supervise. I was put in charge of the surgical/ortho/burn/laceration unit and I created it in this way: Two Code Red beds up front with code cart, ambu bags, intubation, chest tube capabilities. This was set up with easy access to the front door to bring people in quickly and with a clear path to a back exit to move them out to be carried to an ambulance down the street. Directly behind this was the Burn Area with stock piles of IV catheters, fluids, clean sheets, silvadine and dressings. The rationale behind this was that if a burn victim needed to be intubated in the code red area, there would be easy access to the burn care facilities just behind the code area. The Orthopaedic area was set up in a semi-separate classroom area with stockpiles of plaster, ace and kerlex as there was no webril cotton padding. The rationale behind this was that there was no narcotic pain medication available and a door could be closed before the fracture was reduced "live" to reduce noise. Laceration beds were set up complete with irrigation, betadine, suture materials to each bed. Fatigue began to set in as virtually everyone at Ground Zero, if not everyone in the country, had been up since Tuesday morning and about 60 hours had past since the attack...people kept working.� Three bomb threats to the area and a rumor that more terrorists were picked up at La Guardia en route to plane-bomb the city plagued the system but people kept working. At about 0100 Friday we had a general staff meeting where it was announced that at 0700 Friday morning the Government DMAT (Disaster Medical Assistance Teams) would be taking over our field hospital position. DMAT teams are Government-sponsored civilian physicians, techs, and nurses who come with pre-made boxed hospitals and have capabilities to set up extensive field surgical units virtually anywhere. At about 0200, we met with their leaders and ran them though our hospital plan. They seemed very excited that a bunch of ad hoc medical personnel could crystallize and evolve to respond to the need as we had done. They actually copied our hospital plan for their own and set their tents up across the street with the plan being that we would remain "live" until 0700 at which time they would go operational. At about 0300, it began pouring and it was cold. Work in the pit became exceedingly dangerous and it developed into a quagmire of ash and mud. The firemen continued and now, in addition to the other injuries, hypothermia had to be considered. The rain was depressive and although temporarily spirits sank, we were "feeling the pain" so to speak, the resolve became much stronger...somebody has got to pay for this.� Another bomb threat, another false alarm, rain, cold, fatigue, mud, the smell of decomposing flesh on the fireman's boots and everywhere in the air. A Hispanic-only speaking ironworker comes in with a huge contusion on his arm after he slipped and fell into a hole. I told him, thru an interpreter, that he had to be sent to the back to a real hospital. Fear of the INS and deportation flashed in his eyes. I crossed his name off the registration list, put a sling on him, and sent out the backdoor into the rain.� It was clear to me that Ground Zero America was a better choice for him then being sent back to the country he came from. I will never forget this man. At 0700, DMAT went operational and we were shut down.� I walked through the rain to the new hospital across the street.� Really, it was not much different from ours except the medical staff were awake and had clean clothes. I went back and loaded my backpack one last time, picked up my helmet, gas mask, goggles, and rain gear and walked out. From this point on things are kind of hazy as I know I walked up to Ground Zero and stood there in the rain for more than an hour, just looking. I then walked out of the secure area down Western Highway past the reporters all of which wanted something and got nothing. I was drenched. I stopped at Pier 40, a supply staging area, and changed into dry clothes handed out by the volunteers and kept walking...I was drenched again within minutes. A cop picked me up and drove to Penn Station where I got lost and someone took me inside and sat me down. I fell asleep. People were looking at me, they could literally smell what I had just been through. The next thing I knew someone put me on a train headed for DC. That's when I think it finally hit me, this could happen anywhere, anytime, it could happen to the train I was riding. I wanted to vomit.� I slept and woke up in Union Station, Washington, DC. As I walked through Union Station with its high arched ceilings I immediately saw it not as the spectacular architecture that it was but rather as a bombed out building like the "atrium." I got in a cab and it dropped me off at Georgetown Hospital. I must have looked very out of place there with my backpack, filthy fireman's rain gear and helmet/gas mask but that really didn't even cross my mind until now as I am typing this. I bumped into a physical therapist who had just come from a hospital-wide memorial service (one of our physical therapists was on the Pentagon plane). As my cell phone had died about 20 hours earlier, I thought it would be best to go to the office and call my wife. When I got to the office I sat down and for the life of me couldn't remember why the hell I went to the office in the first place. I sat there for about a half an hour staring at the wall until a phone rang down the hall and it reminded me to call Kim, my wife. Another resident drove me home and I fell asleep on the lawn in my sleeping bag for about 3 hours (too dirty to fall asleep in bed, I guess). Now, this morning, after sleep and some food, I feel like I should pass some lessons on. First and foremost, we are an incredible people and an incredible nation. 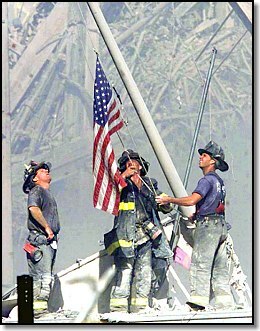 I do believe the hearts of the fireman and iron workers and cops, etc., are in all of us. It is for this reason and others that many people in the world simply don't like us. They are jealous of what we have. These people are highly intelligent and highly motivated and if we foolishly think that the Twin Towers/Pentagon situation is the last of this we are sadly mistaken. If and when this happens again, here are some things which we learned and found very helpful. Get to the site as soon as possible�In this case, many of the rescue leadership (Fireman chiefs, higher level cops) were either taken out immediately or busy (physicians, nurses, techs) at local overwhelmed hospitals. Think about it, if the Pentagon and White House had been taken out as planned, all central leadership would have been out. Recovery and/or retaliation requires organization to be effective.� When I got there, there was mass chaos and a systematic medical infrastructure complete with an understanding of triage as well as a communication system of runners had to be made. Take a large backpack so that supplies can be shuttled to the front zone. Take water and a filtration system. Take food, canned, MRE, bars, etc. Wear boots and durable paramedical type pants with multiple pockets, not scrubs which provide no warmth and are for all intents and purposes useless. A helmet, gas mask with filters, goggles, are a must. Asbestos levels are considered high at 1.25. They were measured at 5.2 at Ground Zero 48 hours after the fact and at 1.75 at the Stuyvesant High School "hospital" 72 hours after the fact. Without goggles, the dust was blinding. Eye washing consumed 75% of our effort. I had my eyes washed out 6 times and I never took my goggles off. Fractures are common with ankle fractures being the most common. Take plaster with you to a MASH unit. Nylon suture is needed for small lacerations to get these men back on the field working. Silvadene is a must as is betadine. We used literally cases of B&L saline contact eye solution to wash out glass, fiberglass, and dust from eyes. Most injuries are extremity related, so roll type dressings (Kerlex) actually work much better that 4x4 with tape for example as these dressings fall off with sweat. Headlamps�remember there is no power and it is impossible to sew in the dark much less get anywhere in the dark without a light. Extra batteries. Raingear, raingear, raingear...even if it doesn't rain, the firehoses drench everything. Extra socks. In fact, all extra clothes packed in large ziplock bags to keep dry. Anything can be made with duct tape, knife, pliers, clothes hanger wire. A large black marker for making signs. This is the most important lesson I learned:� Once a true field hospital system has been established, pick one leader to organize and establish a chain of command who is not involved in patient care and have that person stand in the middle so they are easily seen and obtainable. We had no form of communication other than runners and therefore we needed to know where this person was at all times. Logically, this person should be either trained or experienced in mass casualty or ER trained as this is essentially an ER that is being created. Pick subleaders in each field and have them design their subunits as they see fit.� There is no point in having a surgeon tell a pulmonologist how to triage inhalation injuries or visa versa. In mass casualty, one person who is not to be involved in any patient care, and therefore can stay relatively objective, is to be assigned the primary triage role. This triage "captain" should stand outside near the entrance so that the triage decision is made right away and is not made in the havoc of a busy hospital. The initial triage decision should obviously be major vs minor casualty but someone who is objective needs to make this decision and this person then, thru a system of escorts, directs patients into the hospital to each respective subunit. Further, when actually providing patient care in mass casualty, focus on the one patient that you have in front of you at that time, not the other 50 around you. Move that one patient thru as quickly as possible and then focus on the next. Once patients are treated, move them out of the hospital ASAP or, in our case, upstairs to a rest area�just get them out of the way so new patients can be seen efficiently. Security was an issue at our field hospital as there were three bomb threats. Hospitals are likely and effective delayed second targets from a terrorist standpoint. Design a security detail to block all ports of entry except one entrance exit. Hold meetings with your entire staff every 8 hours minimum and with your leadership staff every 4 hours to address any rising concerns, issues, and to fix problems early before they magnify. Establish an organized pharmacy/supply area in the back with a checklist of incoming and outgoing inventory. In our case we had Guardian Angels serving as runners to the back staging areas 6 blocks back who would then bring needed supplies forward. Establish either a communication or runner system to the ambulance line when a transport bus is needed. In our case we designated one "systems" man who was in direct contact with the physician team leaders. When a physician deemed that an ambulance was needed, the systems man called a runner to run back 2 blocks to the ambulance line. The runner then contacted a "transport" man who then directed a crew of EMTs to carry a stretcher forward and retrieve the victim. A Psychiatry unit is necessary and should be placed in a quiet location away from the rest of the hospital. Many people have either underlying psychiatric issues or primary issues that are brought out in these disaster situations. The non-medical units (food area, rest area, massage, change of clothes) are needed but need to be placed away from the hospital area to avoid large crowds. Finally, not only the fireman needed rest. So did we as exemplified by my staggering around Penn station in a wasted state.� We should have established a better shift system for sustained endurance. Maybe we did and I should have just taken a break but, like the fireman, this is difficult to do and makes much more sense now than it did then. 48 hours on call in a clean hospital is grueling but it is entirely different than 48 on call (after an entire normal workday) in a mass casualty unit. Hopefully we will never have to do this again but based on what I saw in the last two days I sadly doubt that fact. Our way of life is too good to lose and it is worth fighting for. In the aftermath of Tuesday, we need to prepare for this again. © 2001 Michael Karch © 2001 Douglas S. Ritter & Equipped To Survive Foundation, Inc.